The dime is the smallest circulating coin currently manufactured by the United States Mint. The dimes that are listed here have prices that are far from being small. Discover what makes these dimes the most valuable in the world. The United States Mint first produced Mercury dimes (also known as Winged Liberty Head dimes) in 1916. While the Philadelphia mint produced over 22 million coins, and the San Francisco mint produced over 10 million coins, the Denver mint only produced 264,000. This extremely low mintage, combined with a strong demand, has made this coin extremely scarce and valuable. This particular coin is particularly well struck and has brilliant, colorful toning on both the obverse and reverse surfaces. Combine all of these factors, and you have the most valuable Mercury dime in the series. Dimes were first minted by the United States Mint in 1796. Although we can't say for sure, this coin was probably designed by Gilbert Stuart and engraved by Robert Scot. It was tradition back then to add a star for every state in the union. When the mint first produced this coin in early 1797, there were only 13 stars on the coin. Since this coin has 16 stars, we know that the mint produced it in the second half of the year. The United States Mint reported that 25,261 dimes were minted that year. However, it was common practice to use a die from the previous year until it wore out or broke. It is possible that as many as 3,864 were produced with the 1796 date and were delivered to inventory in February 1797. Its pristine condition dictates its extreme value at almost $200,000. In 1798, mint engraver Robert Scot redesigned the U.S. dime to feature a heraldic eagle on the reverse. This new reverse replaced a scrawny eagle that previously adorned the back of all U.S. dimes. In the early years of the United States Mint, mint workers produced coin dies individually and they engraved the date on the die by hand. This particular die variety has a smaller numeral 8 in the date than other coins produced in the same year. Its immaculate condition gives it its value of over a quarter of a million dollars. The United States Mint produced Liberty Seated dimes from 1837 until 1891. Christian Gobrecht designed the dime's obverse and reverse. 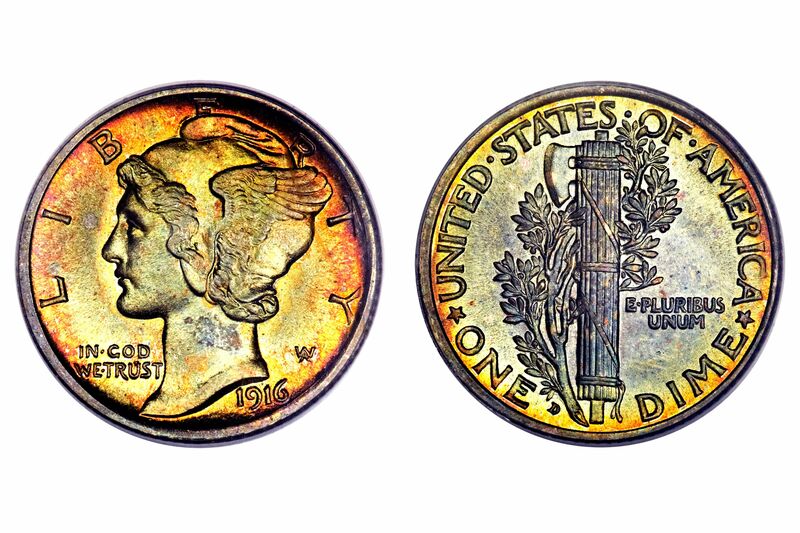 Minor design changes over the years resulted in four different varieties for this dime. Although some Proof coins have mintages as low as two, this is the tenth lowest business strike coin production in the Liberty Seated dime series. The mint in Carson City, Nevada (CC mint mark) was built to produce coins for the United States from the Comstock Lode. Due to the rising cost of silver, The United States Mint reduced the weight of dimes from 2.67 grams to 2.49 grams in the middle of 1853. The mint added pointed arrows on each side of the date to indicate the reduced weight of the coin. The high grade of this particular coin, coupled with its low mintage from the Carson City mint facility, makes it extremely valuable. The mint made minor changes to the Liberty Seated dime throughout its 55-year history. In 1837, when Christian Gobrecht first designed this dime, there was no drapery extending from Lady Liberty's left elbow. In 1840, the design was slightly modified to include drapery extending from her left elbow. However, in 1841, a Proof coin was produced at the Philadelphia mint that did not have any drapery extending from her elbow. Experts estimate that the mint produced only 2 to 3 of these coins. For a coin that is over 200 years old to survive in this fine of a condition is remarkable. 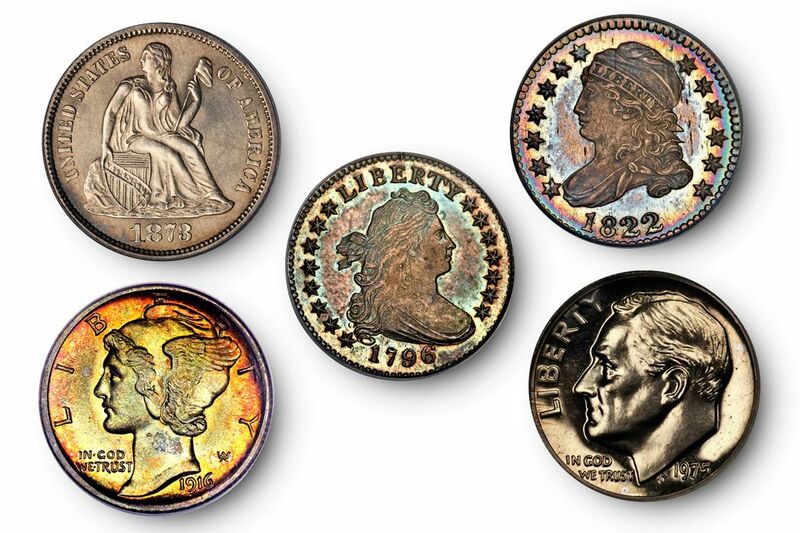 When the United States was in its infancy, coin collecting was not a popular past time. People were more concerned with making ends meet then participating in a hobby. However, somebody removed this coin before it saw circulation and preserved it for future generations. This coin is the finest known 1803 bust dime, and hence it commands such a high price. In 1975, the United States Mint only produced Proof coins at the San Francisco mint facility. Therefore, all coins should have an "S" mint mark on them. However, two coins escaped the mint with no mint mark. Experts have theorized that mint workers inadvertently prepared a Proof die without the mint mark. The mint supposedly destroyed all error coins produced without the "S" mintmark. However, two of them still exist. Here is another example of an extremely old coin in extremely nice condition. Mint records reported that only 21,760 dimes were produced that year. Numismatists estimate that less than 100 of these 1800 dimes still exist for coin collectors to acquire. Since this example is extremely well struck and well preserved, it deserves this lofty coin grade. Any coin collector seeking to assemble the best collection possible of Draped Bust dimes would have to purchase this coin since it is the finest known example of all known 1800 Draped Bust dimes in existence. At the beginning of 1797, the United States only consisted of 13 states. Therefore, mint engraver Robert Scot placed 13 stars around the obverse of the coin. Later that year, mint engraver Scot added three more stars to the obverse design. We know that the mint produced a total of 25,261 dimes in 1797. We do not know how many had 13 stars and how many had 16 stars. We do know that a 1797 dime in this fine of a condition is a truly rare and valuable coin. The United States Mint produced Capped Bust dimes designed by John Reich from 1809 until 1837. Proof coins exhibit extremely fine details and have all the characteristics of a complete and full strike. This coin embodies all these characteristics and has brilliant iridescent toning around the periphery of the coin. Experts estimate that the mint produced between two and five examples of these coins. This rare coin combined with its beautiful condition gives it a value approaching half a million dollars. The United States Mint only produced a total of 8,264 dimes in 1804. Some of these dimes had 13 stars on the reverse between the eagle and the ring of clouds, while others have 14 stars on the reverse. Since the mint engravers engraved each of these dies by hand, the engraver determined how many stars he placed above the eagle's head. Numismatic experts estimate that there are 75 coins existing today with 13 stars and only 20 coins exist today with 14 stars on the reverse. Although numismatists do not classify this coin as a Proof coin, experts agree that some special handling and preparation were involved in the production of this coin. Its details are extremely sharp which indicate that it was struck from a fresh set of dies. Also, there are no imperfections on the planchet that detract from its stunning beauty. Although the mint produced over 22,000 of these coins, numismatists estimate that less than 1,000 exist today. For this coin to survive in this pristine condition and exhibit all the details of a specially struck coin is amazing and brings its value close to $1 million. In 1873, all dimes produced at the Carson City, Nevada mint facility were to have pointed arrows on each side of the date. The mint did produce 12,400 dimes without any arrows by the date, but mint workers supposedly melted all of them. However, one example has survived to this day and is considered unique by numismatists. Given its unique status and extremely high level of preservation, this pushes the value of this coin close to $2 million. Records indicate that the United States Mint produced twenty-four Proof dimes at the San Francisco mint facility in 1894. The reason for such a low production number of Proof dimes is unknown. Several popular theories include a rounding out of the mint's record books, or special presentation pieces given to bankers visiting the mint facility in San Francisco. Regardless of the reason, 13 examples of this coin are known today, and this is the finest known example. The Scoop on First Strike Coins: Are They Really Valuable? Are Coins from Littleton Coin Company Worth It?